Have you ever found a trigger sprayer that lasted the way you wanted, worked the way you wanted and was economical? So I say, ban the trigger sprayer and don’t use them. Why continue to waste money on something that doesn’t work? Now, there are other reasons I say this and top on the list is that trigger sprayers take cleaning solutions and aerosolized them to a point that the Technician is then inhaling the toxicity of the product being used. I realize that there might not be a great amount of exposures at a time, however, immediate exposures to toxic products over a long period of time, result in chronic issues for frontline staff members. In an industry which promotes, “Spray and Wipe”, I implore you to “Ban the Sprayer” and replace it with a FLIP TOP. Oh, and if you are one of the operations who is continually purchasing triggers sprayers only to have them leak, fall apart or just plain quit working, the FLIP TOP will continue to work as long as the bottle it is put on. Why spend budget dollars on something which doesn’t work, wastes product and can harm health? Here is a situation which happened to Darrel Hicks when he was managing an Environmental Services staff at a hospital where he put in 34 years as the head of the department. 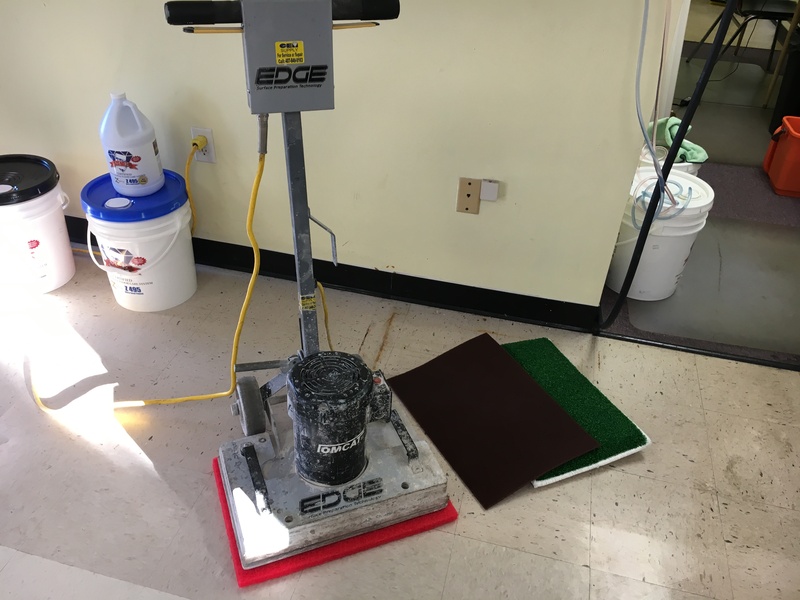 During my ISSA Master Green Technician certification class last week, one of my students was so taken by this simple change that he wanted to make note of it on my weekly LIVE broadcast, Beyond Clean With Dave. Check out what Jason Moore has to say on the subject at the 4 minute mark of this broadcast. While you or your operation may never see an OSHA inspector or have a fine levied against you, there are more reasons to BAN THE SPRAYER than to keep them. If you really want to send a message to your staff that management is concerned about their health, start by making this simple, economical and proactive change today. Start making those changes; make them healthy, positive and proactive. Remember my mantra, “I am a Janitor and I Save Lives”. 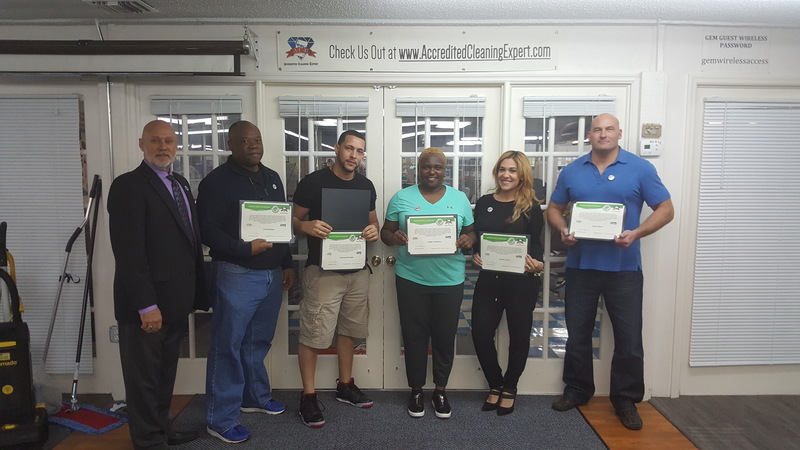 These five individuals just graduated, January 20th, 2017 the ISSA Cleaning Industry Training Standards, Master Green Technician course, provided through GCI Certified and instructed at the A.C.E. 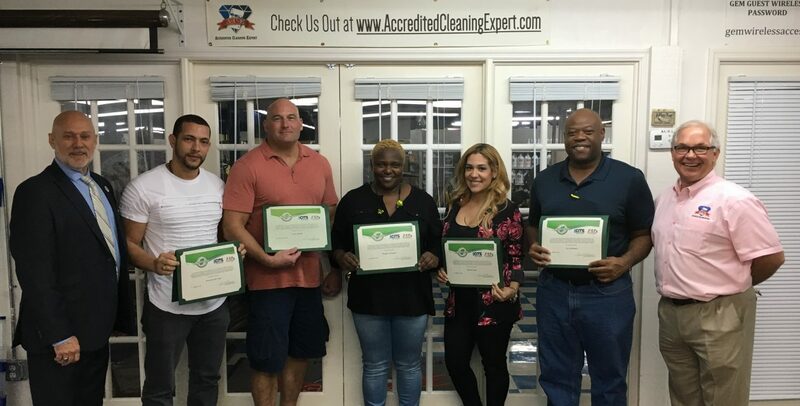 Academy of Cleaning Excellence in downtown Orlando. During five days of instruction, they earned certification in Customer Service, HAZMAT, Restroom, Carpet and Hard Floor Care, just to name a few. Additionally, they started the process in how to build a sell sheet, how to create a WOW statement and found out the principals of workloading. Pascale has this to say about the class. After two years of being in the janitorial industry and with minimal training, finally I have found the background information to understand the importance of my business. Not only do I now know the changes I need to make for my company and how to be a safer place for employees, but in my personal life as well. I would recommend that any new employee, mid-level and/or executive level managers should take the valuable course, as it will open your eyes and mind to see how our industry impacts the life of others everyday. You can view the complete schedule of classes by clicking here. Keep current on what is going on at the A.C.E. Academy of Cleaning Excellence by tuning in to Beyond Clean With Dave every Friday afternoon, 1 PM Eastern. 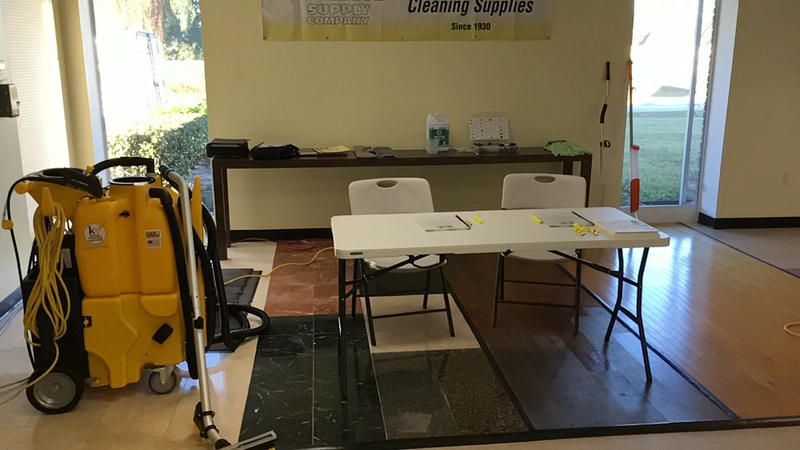 Today’s Floor Care Expert Class Location – Lakeland, FL. 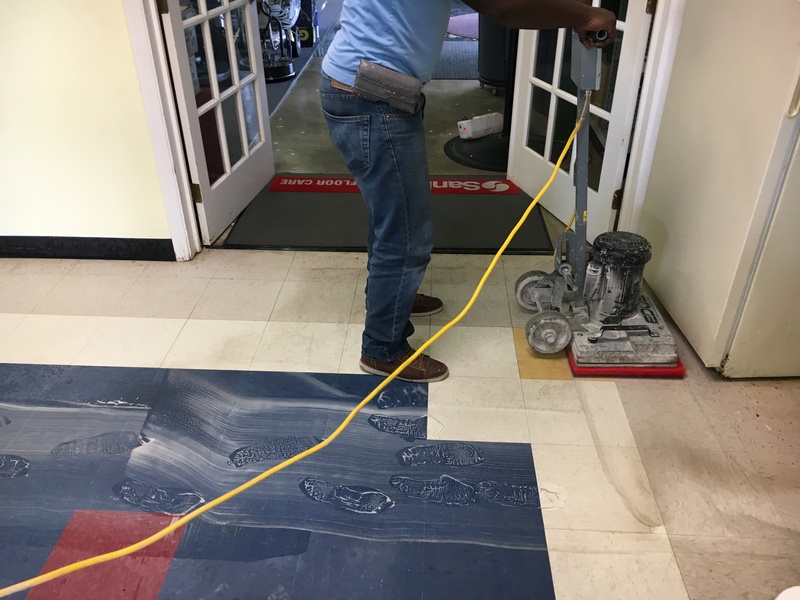 What can save my operation 40% of the normal floor finish I use to maintain VCT floors? What can help keep 90% of dry soil from my polished floor surfaces? 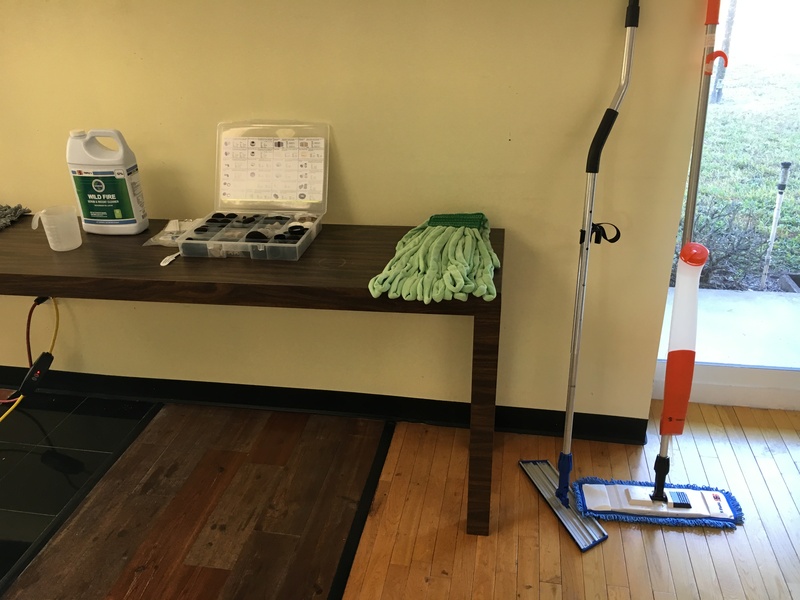 How much should I invest to make more profit on my floor care services? Samuel Sr. and his son Sam, said that they invested in this day of education to learn how to make more money for the work they do. Sam said that he has not spent this much time sitting, not working and so happy to do so, that he will be coming to other A.C.E. Academy of Cleaning Excellence classes in 2017. Both men walked out with their new certificates and smiles on their faces with answers to questions they didn’t even know they were going to ask. Come to a class and ask your questions. You can’t get an answer any other way. Choose from our weekly LIVE classes here. 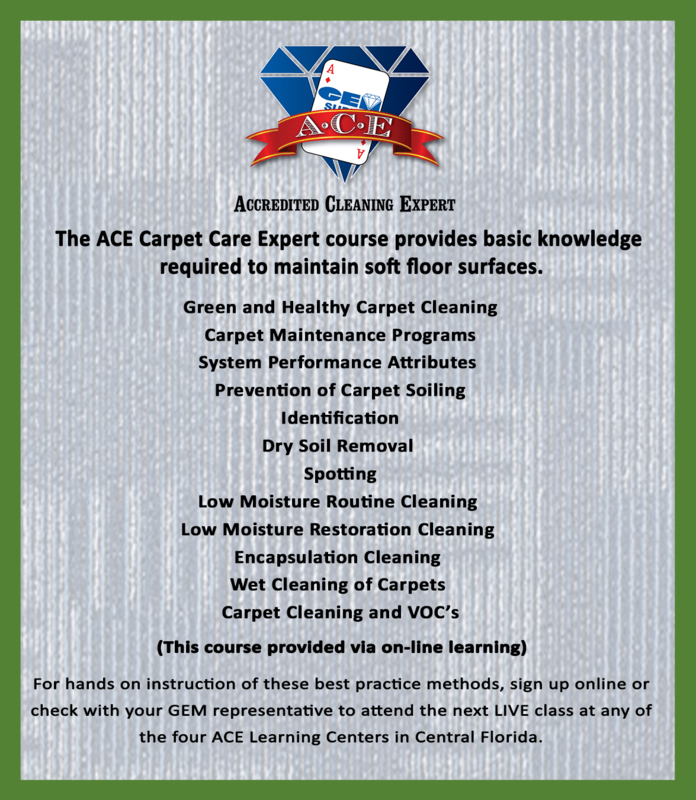 January 24th is the date for our first Carpet Care class in the newly refurbished, A.C.E. Academy of Cleaning Excellence, inside the Orlando location of GEM Supply. Class starts at 9 am and runs till 4 pm. Students need to bring their laptop or smart device to use during the class. Lunch and WiFi are provided. If you have any questions, just ask Dave via the form below.